Unfortunately, since I wasn’t planning on turning this into a post, I didn’t bother to take step-by-step pics of this artwork being created, but it’s really rather simple, so I think I can just explain it. But first, here’s what I made. It’s such a colorful and happy piece of artwork! I absolutely love how it turned out, and I love it in the room. Quite honestly, as I was making it, I didn’t even expect to like the end result much. It was just a fun little project that I enjoyed making, but I thought I would be kind of meh about the end result. But I wasn’t at all! As soon as I got it into the room, added the white frame, hung it on the wall, and stood back to look at it in place, it just made me smile and made my heart happy. 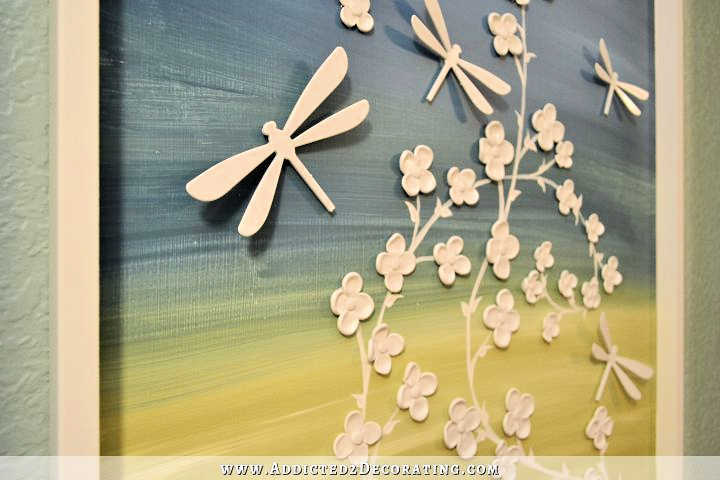 The “canvas” is just a scrap piece of 1/2-inch MDF that I primed and painted solid white. Once it was dry, I used some green Behr paint (Grape Leaves) and some blue Behr paint (Superior Blue) and a 2-inch Purdy paint brush to paint the MDF. 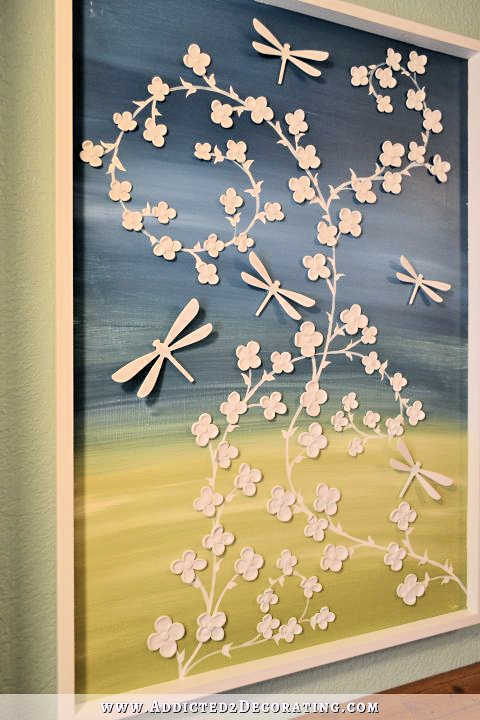 I used a brush dipped in water so that the paint would flow very quickly and easily, and then I added random dollops of white craft paint and brushed back and forth to blend it into the green and blue paint, but I didn’t blend too much. I wanted a variation of color. And to be clear, I did the green first, adding the white paint, and then I squeezed the excess green out of my Purdy paint brush, and moved on to the blue section, kind of blending the blue and green together where they met. If you’ve been here a while, you might recognize the flowers. Those are made out of polymer clay, and I originally made them for this artwork that I made quite some time ago. That was fun to make, but it was never really a favorite of mine, and I never got around to hanging it anywhere at the condo. So I scraped the flowers off and reused them. To make the vines and leaves, I drew the vines lightly with a pencil first, and then went back over them with a small round craft paint brush and white craft paint. Then I just randomly painted the leaves all over the vines. Then I attached the flowers with a hot glue gun. 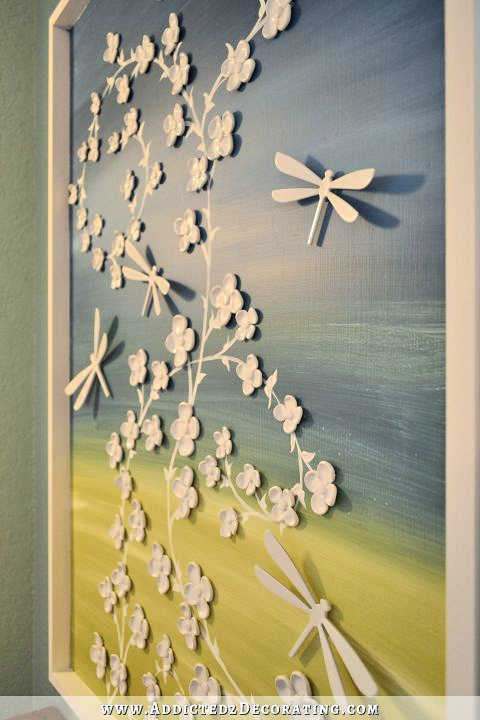 The dragonflies are some that I’ve had for many years. I started out with a 20-pack of these Umbra Wallflutters, but over the years I lost or broke all but these five. So I spray painted them white and hot glued those on as well. I used them just because I had them and would have thrown them away otherwise. 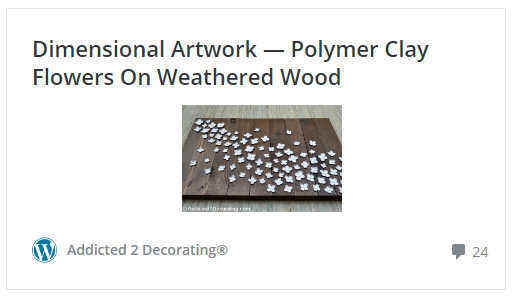 But something like that could easily be created using polymer clay rather than spending $15 on a package of Wallflutters. Some of these projects that I’m doing, like this artwork and building the bookshelf, really aren’t about the condo at all. In other words, these aren’t projects that I’m doing so that I can check them off of a “Things To Do” checklist that I think absolutely need to be finished for staging and selling the condo. These projects are for me. And by that, I don’t necessarily mean that they’ll eventually end up in my house, or that I’ll hang onto them and keep them and treasure them forever and ever, amen. In fact, I probably won’t. I don’t really see a need for a small bookshelf at the house, and this artwork certainly isn’t right for my house. What I mean by “these projects are for me” is that these are my creative outlet, and as a creative person who thrives on creating, I need these projects in my life. I can’t always be about the serious stuff, like installing baseboards, scraping wallpaper, painting walls, painting ceilings, painting doors, grouting floors, etc., which is all of the “serious” work that I’ve been doing at the condo lately. I do enjoy that stuff, but if that’s all I’m doing seven days a week, twelve months a year, I’ll go crazy. I need creative outlets. So yesterday, on a cold and dreary Sunday, I was tired and in need of a restful, relaxing day. I had no plans to do any kind of actual “work” at all, neither at the condo, nor at the house. I simply wanted and needed rest. And my favorite way to rest is to do something creative that requires little to no physical exertion at all. So I decided that I wanted to paint some artwork. Well, right now, I don’t have one single room at the house that is anywhere near ready for a piece of DIY artwork, so I did something for the condo bedroom. The bookshelf that I made the other day was similar. Although it wasn’t the product of my needing rest, it was the product of my desperate need for a creative activity. I went to the condo knowing that I had a real “to do” list of actual work that absolutely had to get done — projects that I really didn’t want to do, and didn’t look forward to doing them at all. So after a couple of hours of work, and really just wanting to pack up and go home, I made a deal with myself that if I would get my work done to a certain point, then I would reward myself with a fun, creative project at the end of the day. That fun, creative project was the bookshelf. I know that all of that probably sounds very strange to non-creative people, or left-brained analytical people, or even to some creative people whose brains are wired completely differently than mine. But this is how my brain is wired. Projects aren’t always about the end product, and how useful or practical they will be. Projects are very often about the process, which I enjoy tremendously. Very often, it’s the very act of creating something that helps me to unwind, rest, relax, and get re-energized. I need that in my life, even if the end product winds up in the trash…or in this case, in a condo that I hope to sell very soon. 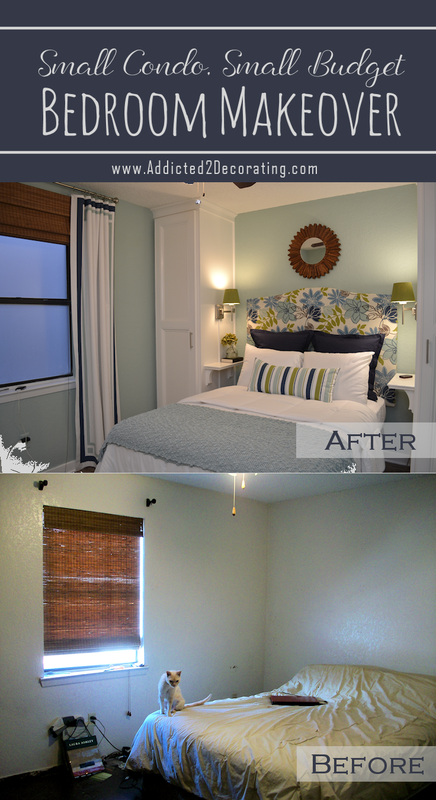 UPDATE: Click here to see the full before and after of this small condo small budget bedroom makeover. Yes, and seeing something finished that needs absolutely nothing else feels good when everything else is chaotic and seems like it will take an eternity to see the end. Wish you would come to Virginia and create at my house! Yes, I can leave an absolute construction mess and design and sew a quilt block. I suppose it’s part of my personal creativity–but I also think I find it comforting to finish a small project that is not just a small step in a much bigger project. Also, I would so love to see your HCG post–I’m hoping to try the diet in January and would love to get your thoughts as you’ve been off. I have a friend who did it and now she says she gains weight any time she eats carbs. That scared me a little but she did use the drops, so I am most interested in what’s been your experience. 🙂 If you care to share to nosy strangers, that is!! Yes, I have plenty of info I’d love to share! I just need to make time. I’ll try to get a post written sometime today (try…no guarantees 🙂 ). If I can make that happen, I’ll put a link at the end of tomorrow’s post. Or the next day’s post. Bottom line…I love it, and highly recommend it. I’ve been off for five weeks, and have easily maintained my weight loss. We’re starting round 2 either tomorrow or Wednesday. i relate only too well! People like us b-r-e-a-t-h-e creativity like we inhale and exhale oxygen; it’s necessary for life! Wow, your talent is amazing. So beautifully done and I totally get it. You can either sell or gift your creations later if you wish. I saw that comment on Facebook and wondered if you would respond. For the vast majority of buyers what you are doing at the condo will help to sell it. The DIYers and those with vision are very much in the minority. Totally understand the creative urge. I was physically tired after working hard this weekend but knitting relaxed me. Ha! Polymer clay, another new medium to play with, yayyyy! Now I’ve got all kinds of ideas buzzing around my head. Yep, I can totally relate to your need to be creative. That is the icing on the cake of all the hard work you’ve been doing. Thanks for sharing! We call that the “Treat Theory” at my house and it works wonderfully whether you’re 9 or 59! It’s amazing how fast I can get the stuff done I don’t want to do if I know I have a treat at the end of it! Great inspiration, thank you. I am not an originally creative person, but do really well when I see something I like to duplicate it. Your blog gives me lots to duplicate. 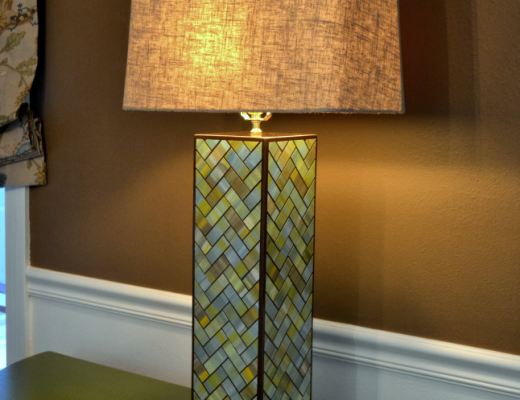 What a pretty piece and it will look great in the room! Your creativity knows no bounds and this is the perfect piece. I might ‘borrow’ the idea as I love the look and it would look great in our computer room to lighten it up a bit. May I ask what the finished size is? Can’t wait to see this completed room as the colors are just so fresh and pretty. I think it’s about 24″ x 36″. Anyone that has any creativity in them understands exactly what you mean!! Keep up the good work. I might not always like everything that you do but that will be my little secret. You don’t need to know when I have bad taste. 😉 thanks for all the ideas …that I like! I can totally relate to the need to be creative to be functional otherwise. I knew it was polymer clay the second I saw it. I absolutely LOVE pc!!! It’s my favorite medium of all time. 😀 Your piece turned out awesome! I 100% understand your need to just be creative and make something NOT on the to-do list. Part of MY enjoyment in reading blogs is the sense of enjoyment the blogger gained from creating whatever it is they are making. I very sincerely hope that is WHY they do it, because they felt like it and can’t help but create. It’s just my luck that they will share the process with me…. I think it’s funny that you are heading off any potential criticism before it has a chance to rear it’s ugly head. You are a feisty one!!! Lol. I read your recent post about people questioning your motives. Promise not to let those idiots get inside your head… You rock! It looks like the paint on this has an almost Linen texture. Is that just your brushstrokes going vert and horizontal? I have never been able to master this paint technique of blending colors, guess I need to try some more, because it’s gorgeous!!!!! Love it! Yep, any look of texture in the paint is just from the brush strokes through the paint. The water that I dipped the brush into helps with that as well. Yes, I can relate! I made snowflakes out of clothespin for package decorations this year … totally relaxing to do even with all the snide comments from the other people in my house about what a waste of time it was. I beg to differ … it was fun, it was cute, and they look fantastic. I will be proud of my kraft paper, burlap ribbon, wooden snowflake packages this year! What’re you gonna do … haters gonna hate! Oh can I ever relate…we are restoring an 1885 Victorian home and can only be there for short periods of time. Last month we were there for 10 days. That’s pretty much 10 days of working from morning ’till night. And like you said that just can’t be done without a creative break or two. Took one. Inspired by your rolling double door project, I had searched the web for a barn door kit. Found a great one for 99 bucks. It arrived on our last visit with many, many parts missing. By the time they arrived at the house my husband had left. I was staying on. I was not even going to attempt that project. This visit we got the project done. No, that is not the creative break. We removed the dining room door, the original exterior door, once the exit to the porch. This part of the porch was converted in the long ago past to an office which has an entrance to the similarly added on long ago bathroom. The problem being that the bathroom door (a hideous luan thing painted blue) bammed into anyone using the toilet. The barn door track was added over that door on the office side. Of course the blue thing was removed! The dining room door was hung on the track. It was pretty cool that it all worked without removing the original lockset/knobs. The upper half of the door was clear glass. The bathroom side of the glass was covered with frosted non-adhesive film, like you did. Now…finally the creative break! We spent probably too much time (like hours) laying out a lettering design for the office side of the door glass, made a template, picked out font style, font sizes, and all that. But the creation could not be produced while we were there. About a week after we left our friend, who created the lettering, sent us photos of the final product installed on the door glass. Love it! Like you, people are probably saying what the heck. You have so much work to do and you spent hous doing this? Yes! It is way cool, fits perfectly with my final vision of the office room and an added bonus; it makes the bathroom seem larger. Once you see something cool and creative and finished that you’ve done amid the chaos it charges up one’s batteries to get going on the seemingly never ending WORK! So, keep up your excellent work! 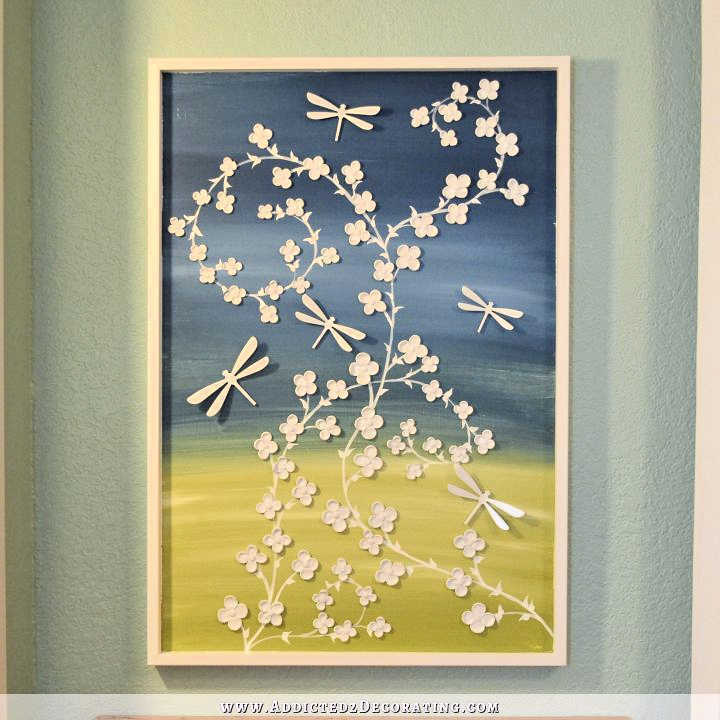 love it – the shadows behind the fireflies – did you paint them in or are they real shadows? They’re real shadows. 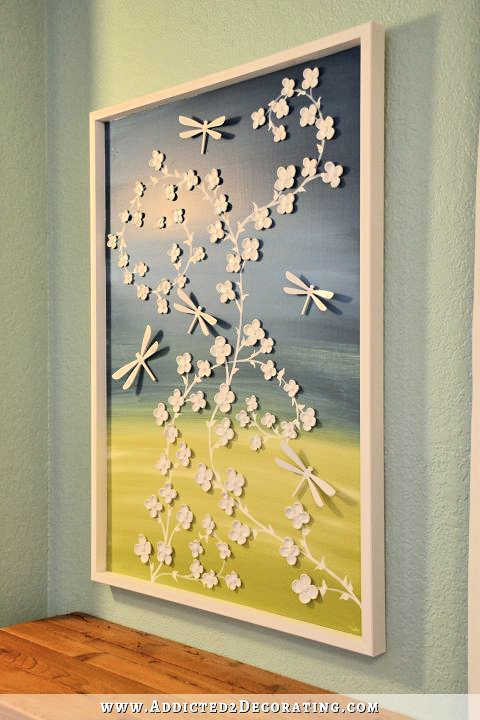 🙂 I had the closet light on when I took the picture, so it cast shadows behind all of the dragonflies and flowers. I know exactly what you mean. I took a pottery class with a friend who cringed at the end of every class when, after two hours of making a “masterpiece,” I threw the clay back in the tub. She was all about the product and I was all about the process. I didn’t need another clay pot, I didn’t want another homemade craft project and I hated to waste the clay by firing it. However, I LOVED playing in the dirt and making the trinkets! Creating can definitely be it’s own reward! Beautiful room! Kelly, I LOVE that example, and I can certainly understand! I’ve heard of artists who paint over and over again on the same canvas. They finish a painting, enjoy it for a bit, then paint it a solid color, and start over again. They’re less concerned about the finished product, and not interested in selling or collecting stacks of finished artwork. It’s all about the joy of the process. 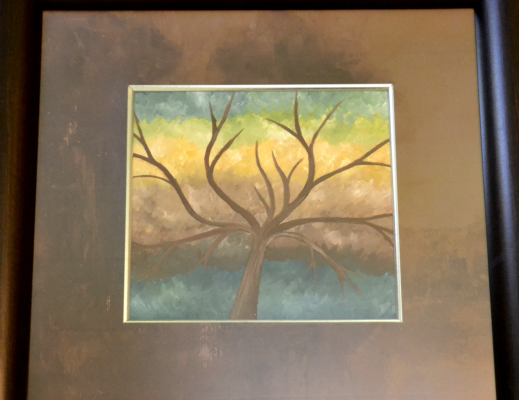 Repainting canvases is a great idea! It also eliminates the problem of clutter, which often robs me of the joy of creating something. I have to THANK YOU for making a long time dream come true for me. I have been trying to get my husband to help me build some shelves in our living room for several years (I’m too chicken to try it on my own!). He has told me over and over he’s not a carpenter and he thinks that he would just mess it up. I show him your blog all the time, particularly anything dealing with making shelves or built ins. For whatever reason when he saw the little closets in the condo he said, “I think I could do that. If we started those built-ins like that we could do that.” I couldn’t believe it. I mean the whole wall unit didn’t do anything to inspire him, but those closets did. Anyway, for my Christmas present we are DIYing a wall unit! 😀 For New Year’s we may be having the biggest bonfire you ever saw with the ruined wood, but at least we’re giving it a go! Thanks! That is why I, a Systems Analyst, took some autobody courses at our local community college after my husband took them. I needed something where I could just take a hammer and fix it and it was done instead of pushing papers around on my desk and having projects cancelled and pulled from under me before they were done after I had spent lots of time on them. I learned to weld and paint cars. Maybe not so much creative outlet like your projects but a change of pace for sure! I’m right there with you, Kristi. Some times my projects for fun turn out well and other times they are a bust. But every time I learn something new and feel rejuvenated afterwards. Keep posting your creative projects, who knows, you may inspire someone else to create! Yes Ma’am! I can totally relate. When the creative beast within calls, there’s no option but to answer! I love, love, love the artwork! Being creative is always a healing exercise. I can relate. Sometimes I do silly stuff like making pillows or threading beads on floral wire. I don’t need more pillows and I’m not sure what to do with beaded floral wire (suggestions? ) but the right-brain wants what the right-brain wants! I’m likely one of those left-brained, analyst types, but I too sometimes need a project just like you have made. No need to make apologies for who you are or how you are wired! I love this and you did a great job as you always do. I would definitely purchase something like this. The colors are beautiful and I love the vine with flowers and the dragonflies. Love the artwork, and totally understand your desire to create, rather than always doing something to check off the list. Separate question: I noticed you used the term bookshelf for what I would call a book case. I notice that most people also do this. On Craigslist, a unit such as that is usually called a bookshelf. In my mind, a book shelf is an individual shelf hung on a wall. A book case is a piece of furniture with more than one shelf. Can anyone help me with this terminology? I’ve always used the term “bookshelf” to describe anything that is stand-alone piece of furniture, regardless of how many shelves it has, or how big it is. The term “bookcase” is what I use to describe something that is built in as a permanent fixture in a room. The little two-shelf piece I built for this room, I call a bookshelf since it’s a separate piece of furniture. What I built in the living room at the condo is what I would call a bookcase. Oh yes, you need to express your creativity! It can be so overwhelming to have a whole list of undone projects. To just express yourself and have something pretty to look at, at the end of the day, is so rewarding. Oh yes I can totally relate! 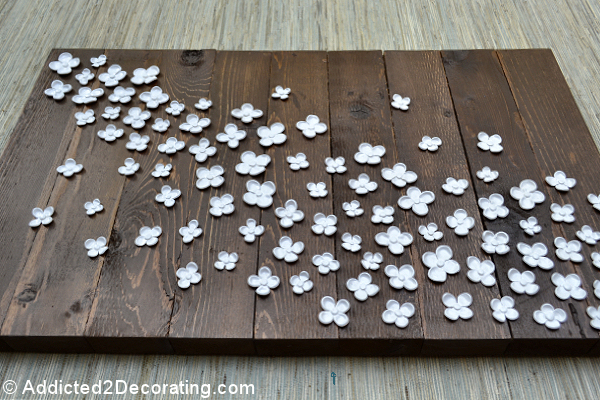 LOVE LOVE the art work with those awesome re-purposed clay flowers. And it even looks fun! I love building stuff as my creative outlet. Sometimes you’ve just gotta do something creative – – ’cause you CAN! 🙂 Lately I’ve been building little trinket boxes out of different materials and in different styles. And they’re not wasted efforts, because I’ve mastered something, and they’ll eventually make great Christmas gifts. Now, on to decorate them to fit the personality of the folks who will receive them. That’s so fun — just the decoration can make some totally plain bits of scrap wood into fun little gifts. I’m on a ‘bling’ kick lately, adding little rhinestone ‘flourishes’ to some to give them a bit of girly flair. Any time that you want to have “fun”, run like the wind and create! Over the last four years since my husband’s retirement, I have so much time to run, play and create! I still cook and clean and do laundry, but there’s so much I am still after! 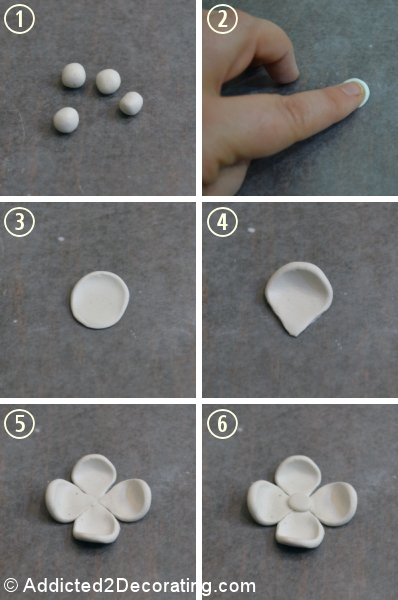 I’ve never tried polymer clay but I am looking forward to doing so! And the painting and floral arranging and…………………! I absolutely understand! Who in the world wants to do the boring stuff all the time?? As for your artwork, I love it! There are so many dimensional stickers available now due to the scrapbooking craze, seems the possibilities for this project would be endless even if you don’t want to use clay. Thanks for showing us! I can totally relate, Kristi! your flowers are so pretty. 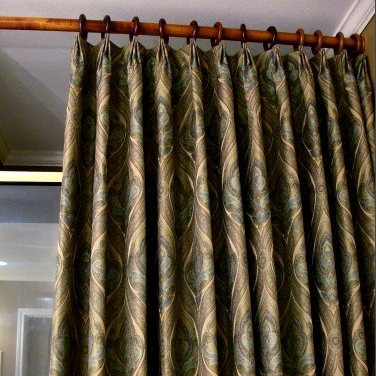 gave me an inspiration which is what i needed for a piece that can hang over my own sofa. I made a Christmas tree skirt the other day on the spur of the moment which i didn’t have any exact plans how to configure and just went with my gut and natural flow and it came out beautiful. I just needed to let my creativity side out from being a stay at home mom all day. I love the fact that you create just for you, and that piece is very beautiful, I create for myself too and hope to create something as cool as this! Christi, I can totally relate. I do the same thing. I have this insatiable need to create and there for a while, I thought something was wrong with me. I get excited and tell my friends what I’m working on or what I have just created, they just look at me and roll there eyes. They say I waste money because I redo projects at my leisure. Well, I know they are envious, and would like to do projects too, but they don’t have the time. You have inspired me in so many ways, you have no idea. I love all of your work! I just drool over the furniture you make and all the woodwork projects. I would really love to meet you one day and just kick around some creative ideas. You are my creative hero and your blog is my absolute favorite. No one else compares. My first post…I enjoy all your creative processes…whether work or just enjoyment. To me…you are a DIY breath of fresh air…and DIY means it is yours…and you can do what you want…the way you want it. You own your ideas and all that your ideas become. Your honesty and integrity are tops in my view. Please sign and date your creative art piece…even if you keep it…and repurpose it later on…your signature will always remind you of this time in your life. Now, I’ll close and see if a DIY moment strikes me!!! Thank you for being you!!! I totally get it. However, I’m also wondering if you’re stalling selling the condo, since so much of you is in it. No, I’m not stalling. I promise. 🙂 I’d sell it in a heartbeat today and never look back if I could. My brain swings both ways and I understand completely! Your artwork makes me smile and it inspires me! Bravo! Wow, amazing work, very creative! I’d decided I hadn’t the artistic ability to pull this off, so I recently bought a finished canvas similar to yours for one of the bedrooms. But yours is so much finer, and I keep returning to look at it. Today I read most of the posts and decided to return mine, get my money back, and give this project an honest try. Thank you for all of the diverse projects you post. I’m inspired.